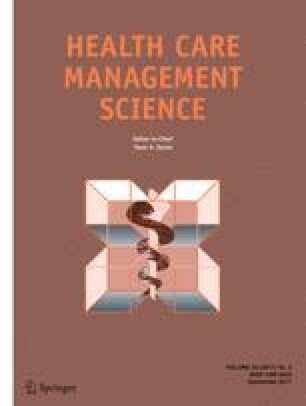 Traditional nonparametric frontier techniques to measure hospital efficiency have been criticized for their deterministic nature and the inability to incorporate external factors into the analysis. Moreover, efficiency estimates represent a relative measure meaning that the implications from a hospital efficiency analysis based on a single-country dataset are limited by the availability of suitable benchmarks. Our first objective is to demonstrate the application of advanced nonparametric methods that overcome the limitations of the traditional nonparametric frontier techniques. Our second objective is to provide guidance on how an international comparison of hospital efficiency can be conducted using the example of two countries: Italy and Germany. We rely on a partial frontier of order-m to obtain efficiency estimates robust to outliers and extreme values. We use the conditional approach to incorporate hospital and regional characteristics into the estimation of efficiency. The obtained conditional efficiency estimates may deviate from the traditional unconditional efficiency estimates, which do not account for the potential influence of operational environment on the production possibilities. We nonparametrically regress the ratios of conditional to unconditional efficiency estimates to examine the relation of hospital and regional characteristics with the efficiency performance. We show that the two countries can be compared against a common frontier when the challenges of international data compatibility are successfully overcome. The results indicate that there are significant differences in the production possibilities of Italian and German hospitals. Moreover, hospital characteristics, particularly bed-size category, ownership status, and specialization, are significantly related to differences in efficiency performance across the analyzed hospitals. We express our gratitude to Kristof De Witte for providing the R code, which we used for our analysis, and to Cinzia Daraio for providing the MATLAB code, which we used for reference. We thank Bruce Hollingsworth for his guidance in the conceptualization stage of the study. We also thank our three anonymous reviewers for providing insightful comments and suggesting ways to improve our study. in which H XY (x, y) is the probability that a decision-making unit (DMU) operating at (x, y) will be dominated. in which F X (x) is the cumulative distribution function of X and S Y|X (y| x) is the conditional survival function of Y.
where I(∙) is an indicator function that takes the value of one if the argument is true and zero otherwise. Cazals et al. and Daraio & Simar  demonstrated the conditional measures of efficiency by incorporating the set of environmental variables Z∈R r that might explain part of the production process. in which S Y|X , Z (y| x , z) = prob(Y ≥ y| X ≤ x, Z = z) is the conditional survival function. in which K(∙) is some kernel function with compact support and h n is the observation-specific bandwidth. De Witte & Kortelainen  suggested employing the kernel function of Li & Racine , which accommodates continuous, ordered, and unordered discrete environmental variables.